As the world population continues to grow, so too does the demand for agricultural products — including dairy. But an increase in milking cows has resulted in an increase in nitrogen emissions, one of the largest pollution issues surrounding the dairy industry. Allison Stevens decided to tackle the issue as a graduate student at the University of Idaho. She presented her research at the 2019 Three-Minute Thesis/Three-Minute Masters competition held in Boise and earned a second place finish against other graduate students across Idaho. She graduates with a master’s degree in animal science in spring 2019 and has set the groundwork for further research on this complex topic. Animal and veterinary science: dairy, B.S. Scientists and producers know that feeding dairy cows less protein results in less excess nitrogen and less nitrogen emissions. However, feeding less protein often results in a decrease in milk production. U of I professors in the College of Agricultural and Life Sciences’ Department of Animal and Veterinary Science developed a proposal to study how to reduce protein while maintaining production. They recruited Stevens to lead the project following her 2017 graduation from U of I with a bachelor’s degree in animal and veterinary science: dairy science option. Stevens conducted a four-month study with six Holstein cows from the U of I Dairy Center. Three cows were fed an industry standard diet that included high amounts of protein content. The other cows were fed 2 percent less protein. Cows on each diet were also fed one of two complimentary amino acid supplements. The study served as a pilot for U of I researchers to determine if further research is warranted on a larger scale. “They’ll be looking into the supplements more because that’s the whole goal, to lower the protein even more, get rid of even more nitrogen waste and use these specific amino acids to target milk production and keep it up,” Stevens said. Reducing the environmental impact is the main concern, but a reduced protein diet while maintaining the current milk production will also result in lower feed costs for producers. Her research experience will serve her well after graduation as she seeks a position as a dairy nutritionist. In that role she will visit dairy farms and advise producers on how to mix their feed as well as what supplements and grains are needed to increase production and ensure the overall health of the herd. 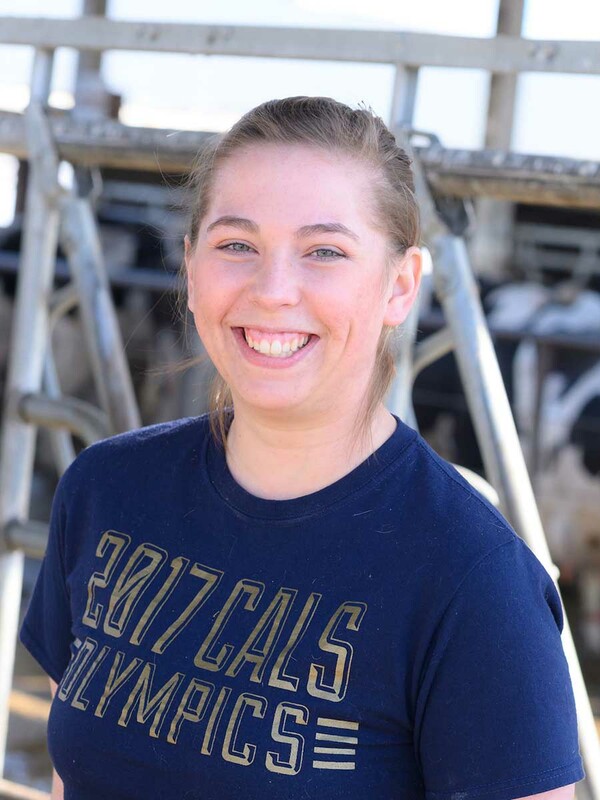 CALS student Allison Stevens will pursue a career in animal nutrition after graduating from U of I in spring 2019. Stevens grew up in Boise but did not have a traditional agriculture background. Her father is a retired firefighter and her mother works as a truss designer. Stevens decided to join FFA as a student at Mountain View High School in Meridian because she loved animals and was interested in becoming a veterinarian. The FFA advisor at MVHS, Trish Stokes, encouraged Stevens to join FFA and participate in animal science projects. When Stevens decided she wanted to raise and show sheep in FFA, Stokes allowed her to house the animal on her farm. Stevens initially decided to enroll at U of I for her bachelor’s degree with the goal of becoming a large animal veterinarian. The Introduction to Dairy Science course taught by Animal and Veterinary Science Professor Amin Ahmadzadeh opened Stevens’ eyes to the dairy industry and prompted her to re-think her career goals.